​Our equipment and experience enable us to fabricate and perforate metal to exacting standards. We have a talented and experienced team of engineers, technicians, and welders that can help with any forming, notching, bending, punching, or fabrication request, and the machines and tools to get the job done right. We offer a wide range of fabricating capabilities, including punching, forming, perforating, welding, laser cutting, water jet cutting, light stamping, custom tooling and shearing. Our facilities and equipment allow us to do small and large production runs. We will assist in the design and development of prototypes for larger projects. We offer first article inspection to ensure the quality and specifications of your component before we undertake a final production run. ​​​Dayton Manufacturing’s precision welding capabilities rise to the top. We provide our customer's cleaner, more consistent welds while offering more precision and flexibility in hard-to-reach areas. DMC has the capabilities and the experience to weld metal a variety of gauges and thicknesses. We are well-versed on how to weld various kinds of metals like aluminum, carbon steel, and stainless steel. We offer many different welding processes including MIG, TIG and spot welding, along with our robotic welding. Our additional capabilities enable us to partner with our customers to meet challenging quality standards through precise heat control and exact penetration, join corner edges of thin materials and achieve repeatable results time after time. We also offer orbital welding in stainless steel up to 3" in diameter. ​Metal cutting techniques fall into three broad categories: manual tools, machine cutting, and burning/welding tech. All have their uses in sheet metal fabrication, though there is arguably one technique that stands out above the rest. Manual tools are the most basic. The most common tools are saws, chisels, and shears, all of which are manipulated by hand to pierce and cut the metal. Obviously, hand-cutting is not the most efficient or cost-effective method. A few steps up from manual tools is machine cutting. Machine cutting involves turning, drilling, and grinding with different tooling to achieve a smooth edge in each component. Tooling is the most expensive part of machine cutting - the cutting edges will wear down quickly and need to be replaced often, though they are otherwise quite efficient. 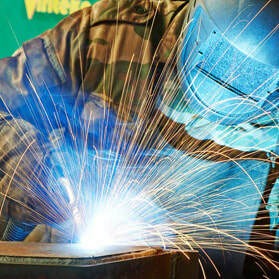 Modern technology has allowed for another category of metal cutting: burning or welding technologies. These types of cutting are highly efficient and precise. Included in this category is a flame, plasma, water jet, and laser cutting. Lasers, in particular, are a versatile cutting technique - they can cut almost any material (the only exception being super reflective metals), slice through thicker components, and are super speedy for large and complex orders. These specific attributes will vary depending on the laser. What else makes laser cutting great? Lasers mean clean edges and a smooth finish. As the laser travels, anything in its path is vaporized, burned, or melted. It leaves no odd tooling marks or debris, though the heat can warp certain materials. Its warping tendencies should be considered when designing a component for laser cutting. Laser cutting is quick and precise. Complex details, small projects, and tight tolerances are made easy by the laser's precision. Lasers don't dull, so there's no pause during manufacturing to switch out tooling, or additional tooling replacement costs (though equipment costs can be high overall). 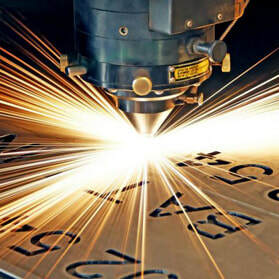 Lasers are programmed via computer, which adds to the consistency of the cuts and design versatility. No other modern cutting technique is as useful in high-detail sheet metal fabrication. Laser cutting is the most flexible metal cutting style. Though it might be more expensive than some other styles on this list, its precision and versatility are unmatched. If you have a project that requires very tight tolerances and clean cuts, laser cutting should be at the top of your list. ​If you need online waterjet cutting services we are one of the most capable and affordable sources and we can get the job done right. We stock a wide variety of materials, use state-of-the-art machines and diligently follow all design specifications. We continually strive to improve and optimize our processes and maximize customer convenience. Our customers range from inventors to businesses to government agencies. We are focused on quality and customer service. 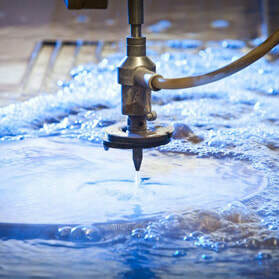 ​Waterjet cutting is a process that produces shapes by cutting sheet material using a thin, high pressure stream of water containing abrasive particles. The water jet is at very high pressure - typically 84,000 PSI and mixed with garnet abrasive. The sheet being cut is often submerged in a tank of water to reduce the resulting noise. The high-pressure is created by a special pump designed for the purpose. Almost any material, hard or soft, can be cut by waterjet: Aluminum, Stainless Steel, Copper, Nylon, Steel, Acetal, Polycarbonate, Polystyrene, Fiberglass, Brass, Carbon fiber, PTFE, Titanium, ABS, PVC, Sterling Silver, Spring Steel, Bronze, Rubber, Foam, Marble, Laminates, Gasket material, etc. Very few materials are impractical. Kerf width is typically ~.035", hence inside corners will be rounded to ~.020" radius. There may be some hazing on the surface - especially near the edges. Thin flimsy structures and shapes where a high proportion of the material is removed may present difficulty in meeting dimensional and flatness tolerances. Edges can be slightly sloped - the bottom side will have slightly more material at the edge than the dimensioned top side.